Password Door - Add password protection feature to existing programs. There are many great software that you use them frequently, you know them well: MS-Office, WinZip, Media Player, Real Player, AcdSee, Outlook Express...You want them to be password protected so that none can use those programs on your computer without passwords, but most of those programs have no password protection, so anyone can use them. With Password Door, you can add the password protection feature to any of those programs. 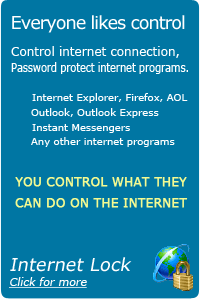 Restrict internet access, password protect internet programs, connections and web sites. Password protect any program on your computer, add password protection feature to existing programs. Helps create virtual desktops to limit users to use only the programs you specified, along with all other features of Desktop Lock. Locks, hides, password protects your files and folders. Securely erase files, folders and disks. Erases files, folders, external disks, sd cards.